What is it about a black and white image that fires our imagination? How does the removal of color from an image have such profound effect on what that image says to the person viewing it? In this post I am going to look at three of my photographs and discuss how the black and white versions differ from their color counter-parts. 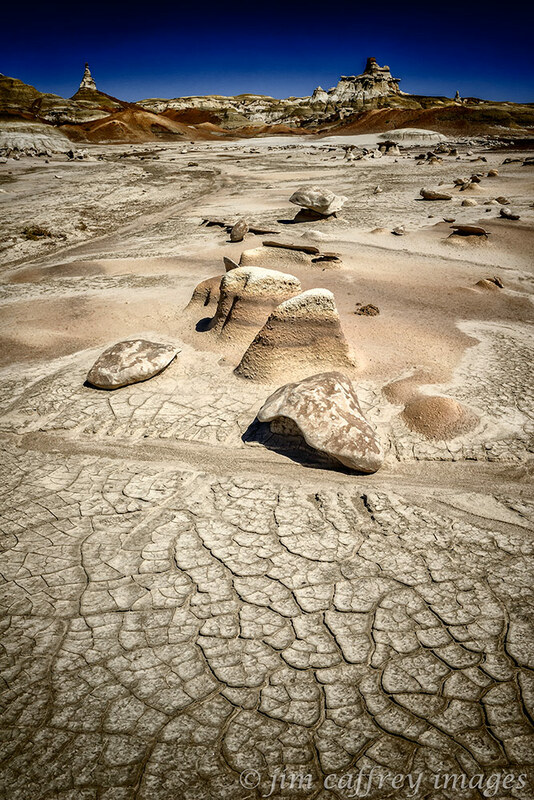 This first image was made at Ah Shi Sle Pah Wash in New Mexico’s San Juan Basin. The gibbous moon was riding low in the sky and I captured its transit behind this rock formation. 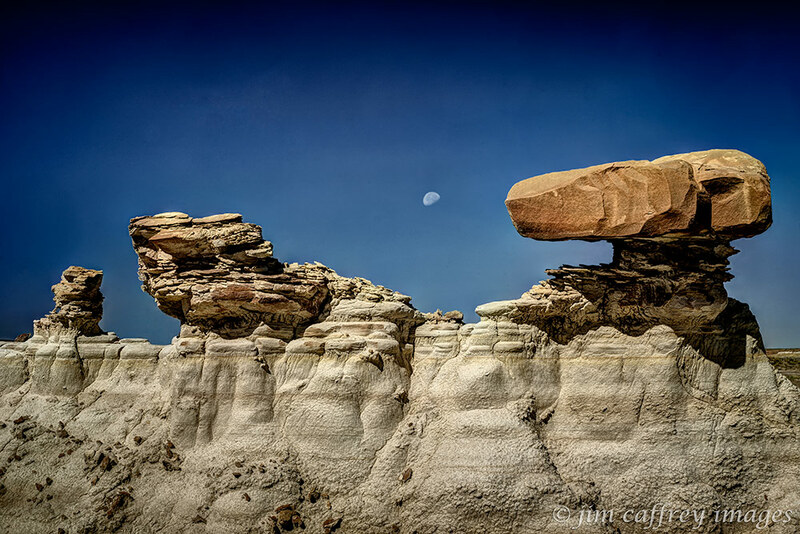 In the color version, while the moon is still center stage, it is overpowered by the strong contrast between the complimentary colors in the sky and the orangish brown rock. In the black and white image, the moon regains its prominence; even though it is relatively small in the photo, the contrast between it and the dark sky gives it some visual weight in the frame. The foreground is suddenly more about the mudstone supporting the rock, again because of the lighter tones in that part of the image. Another element that benefits from a black and white conversion is a textured pattern. This image of the cracked earth near the Eagle’s Nest in the Bisti Wilderness does pretty well in color, but when converted to black and white, the texture in the foreground becomes more prominent. The image is suddenly more about the dry cracked earth which was my intent. Sometimes it’s more about the overall feel of the image. 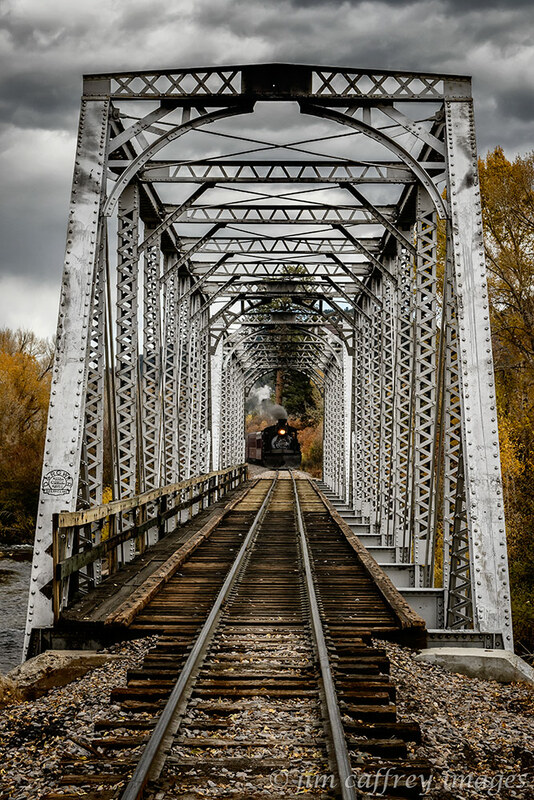 This last photo of the Cumbres-Toltec was made as the train was crossing the bridge over the Chama River. I like the color version but the mood isn’t quite right. By converting the image to black and white and then adding a sepia split tone, I was able to pull the image together and give it a more somber voice. There are many ways to accomplish a monotone conversion using Photoshop, Lightroom, or any of the other image editing applications that are available. The most important part of the process, I believe, is having the ability to control the tones as they relate to the colors in the original image. By using the B&W adjustment layer in Photoshop instead of a greyscale conversion (which dumps all of the color information), or the HSL sliders in Lightroom you can adjust these tones individually and your results will have more visual punch. For the past month I have been learning to play the fascinating sport of train tag. 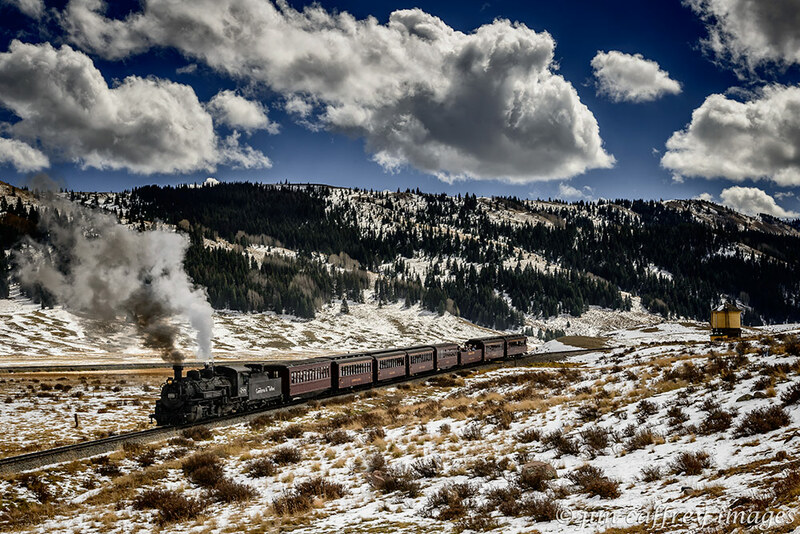 It involves learning the route and the timetable of a certain train that runs between Antonito, Colorado and Chama, New Mexico. After becoming familiar with these elements, the next step is to drive from one point to another along the train’s route; the trick being to arrive at the next place in time to set up a shot before the subject arrives. After several weeks practice, I became pretty adept at getting to the good spots and making the images I wanted. I made this image the first day I went up to try to get some fall photos of the train . It was mid September, way too early for fall color. I’m glad I went though, because it took several tries to get it right. The more I worked the scenes, the more intimate I became with the environment and the train’s schedule. As a landscape photographer, I rarely need to worry about time restraints, so this was a good experience for me. The second image was made at the beginning of October. The leaves were just starting their transformation and I noticed that some of the trees were pretty dull, going almost immediately to brown. I’m not sure, but I think it has to do with the greater than usual scarcity of moisture we’ve been experiencing here in the southwest. Fast forward another week and I finally found what I was looking for; the aspens had reached peak color. Even though some of them were still wearing green, I knew that this was probably the optimal time, so I had to make the best of it. 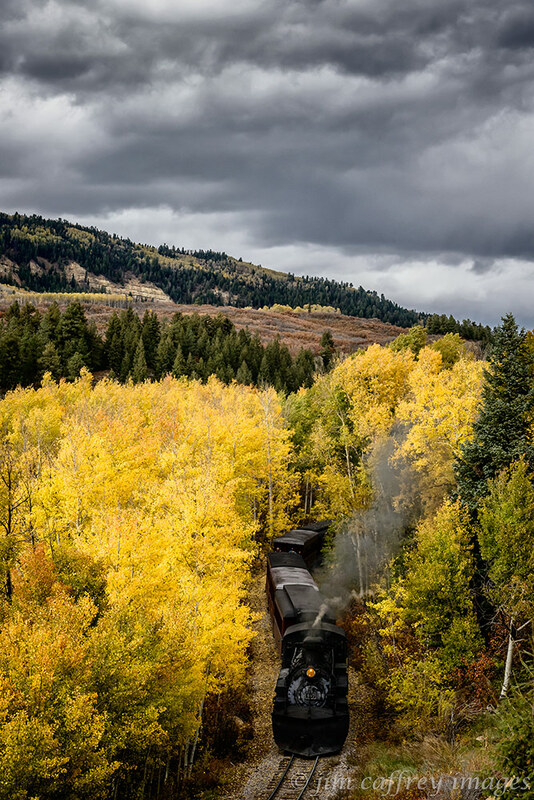 This image shows the train making its way through an aspen grove about five miles north of Chama. Farther up the route, the color was already gone and the first snow was beginning to cover the ground. I figured the same would be true at the lower altitudes within a few days, so this had to be it. It was also the end of the season for the train so this definitely had to be it. 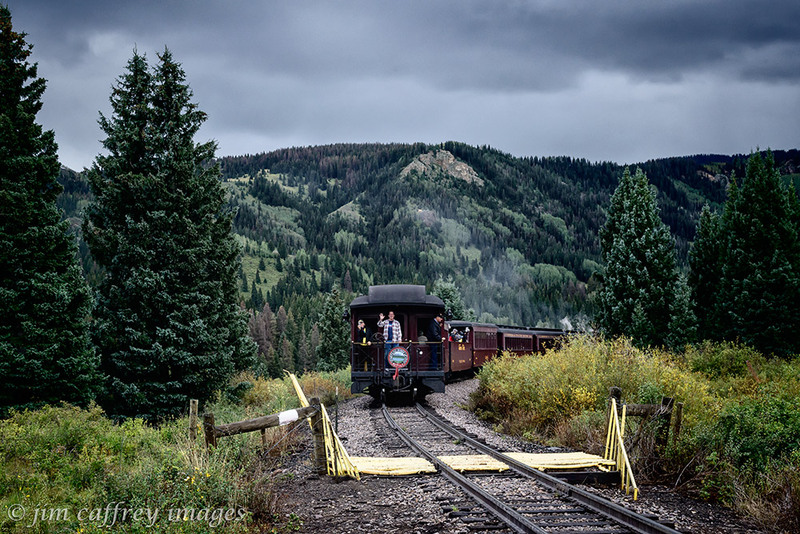 To finish things off I wanted to capture the train approaching its destination (in this case Chama), so I began looking around and with Robin’s help, managed to find this trestle about a half mile north of the station. 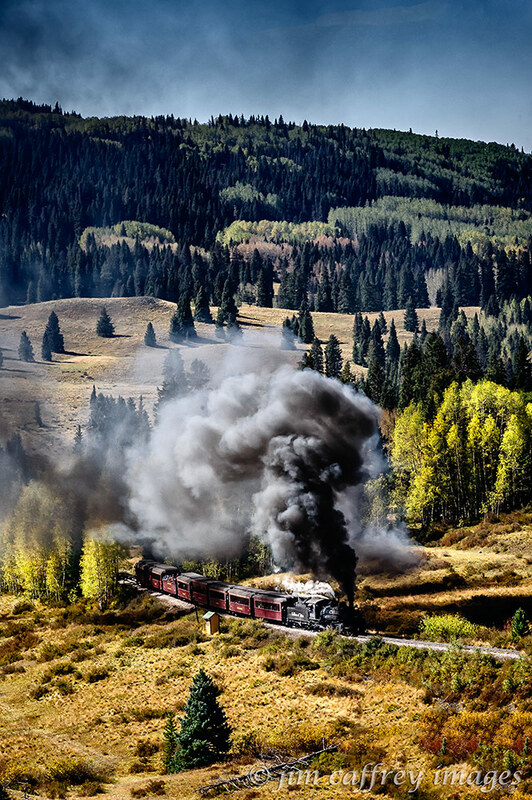 We raced the train down through the canyon stopping to photograph at all the good vantages and then made a mad run for the road that brought us close to the trestle. 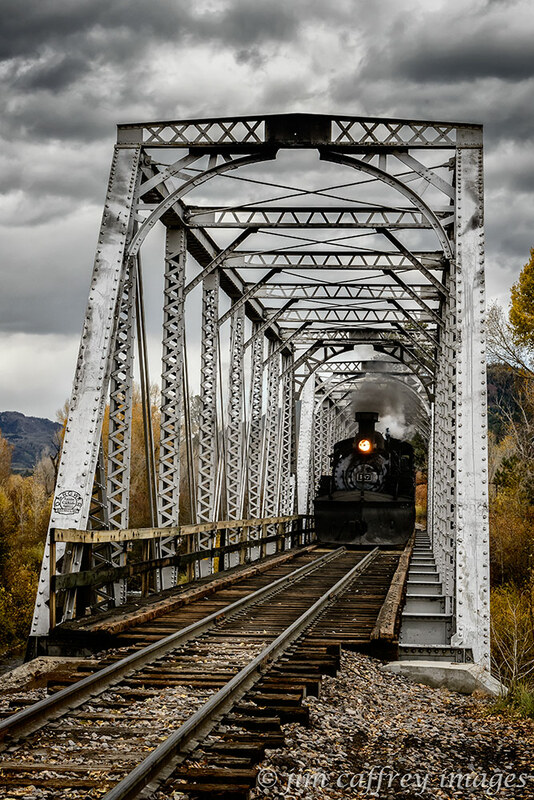 We had to make it in time to run across the trestle ahead of the train to get the image I wanted, but it was well worth the effort. As the train came closer, I chickened out and moved from the center of the tracks before I made this final image. I created this blog as a way to share my images, and to receive constructive criticism. I hope it will also become a forum for mutual exchange of ideas. So pull up a chair and talk to me. All images and text on this site, unless otherwise noted, are the property of Jim Caffrey Images and are protected by international copyright law.